Russia seems to be getting serious about building an international alliance of extreme right parties that would aim at undermining the liberal democratic consensus in the West. In addition to providing financial support for parties such as France’s Front National and using extreme right activists and politicians as tools of propaganda, Russia is now building what it calls the “World National-Conservative Movement” (WNCM). A number of the internal documents (passed to me by the Moscow-based "Sova Centre") provide an insight into the agenda and structure of the WNCM. The driving force behind the movement is the St. Petersburg branch of the extreme right Rodina (Motherland) and the Russian Imperial Movement. Rodina was founded in 2003, and one of its co-founders was current Vice Prime Minister Dmitry Rogozin. While Rogozin is not a member of the party now, he is rumoured to maintain the contacts with the party. The Russian Imperial Movement, whose self-described ideology is “Christian Orthodox imperial nationalism”, was founded in 2002. The chair of the organising committee of the WNCM is a prominent member of Rodina Yuriy Lyubomirskiy. The phrase “national-conservative” in the title of the movement should not confuse the readers. “National-conservatism”, while being a legitimate term in political science, is only a misleading self-description of the WNCM to avoid the term “extreme right”. The WNCM describes itself as “an international association of political parties, organizations and private citizens formed on a voluntary and equal basis by representatives of various countries and peoples on the basis of their commitment to achieving the goals” of the movement. The manifesto of the movement claims that the world is governed by the ideology of “liberalism, multiculturalism and tolerance”. This, in the view of the activists, results in “the erosion of nations, massive migration from countries with foreign civilizational bases, falling away from religion, replacement of spirituality by materialism, impoverishment of cultures, destruction of the family and healthy moral values” through “abortion, propaganda of debauchery and acceptance of sexual perversions”. Furthermore, the manifesto refers to the “super-national institutions” such as the EU and NATO, and argues that these forces represent “the global cabal” which, in the Russian cultural discourse, is essentially a euphemistic reference to the global Jewish conspiracy. 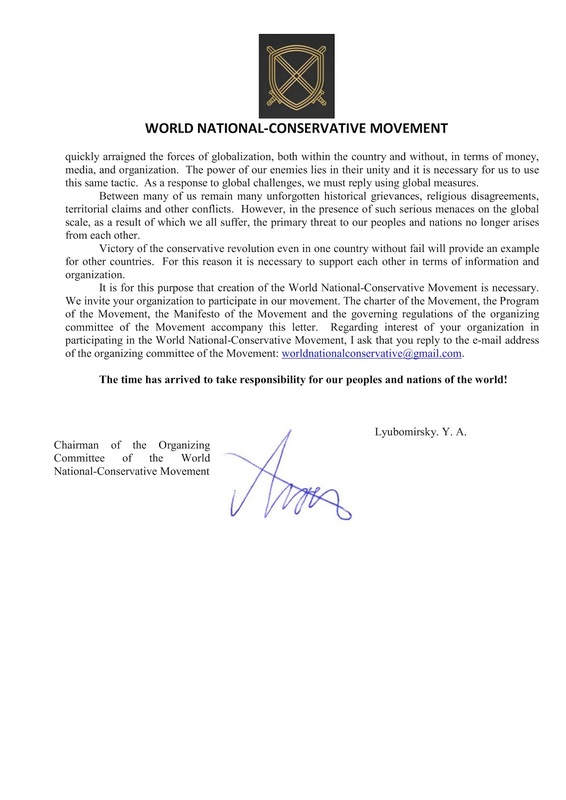 The WNCM aims to counter liberalism and globalisation by staging a “conservative revolution” and bringing far right parties to power in Western societies. The manifesto claims that a “victory of the conservative revolution even in one country [...] will provide an example for other countries”. Establishing the WNCM is considered the first step in this direction. The scope of the Russian project is rather impressive, and the list of parties and groups that the founders of the WNCM have invited to participate in the movement consists of 58 organisations. The majority of them come from Europe and the US, but there are also organisations from Chile, Japan, Mongolia, Syria, and Thailand. The political positions of the majority of these parties leave no doubt that the WNCM is an extreme right, rather than a “national conservative”, movement. Here are some of the names from the list: Nordiska Motståndsrörelsen and Nordisk Ungdom (Scandinavia), Danskernes Parti (Denmark), Golden Dawn (Greece), Nationaldemokratische Partei Deutschlands (Germany), Falanga (Poland), Generace Identity (Slovakia), Renouveau français (France), Noua Dreaptă (Romania), British Unity (UK). The list, however, also features less extreme – yet still far from the mainstream right – political parties such as Perussuomalaiset (Finland), Jobbik (Hungary), Slovenská národná strana (Slovakia), Kongres Nowej Prawicy (Poland), and some others. 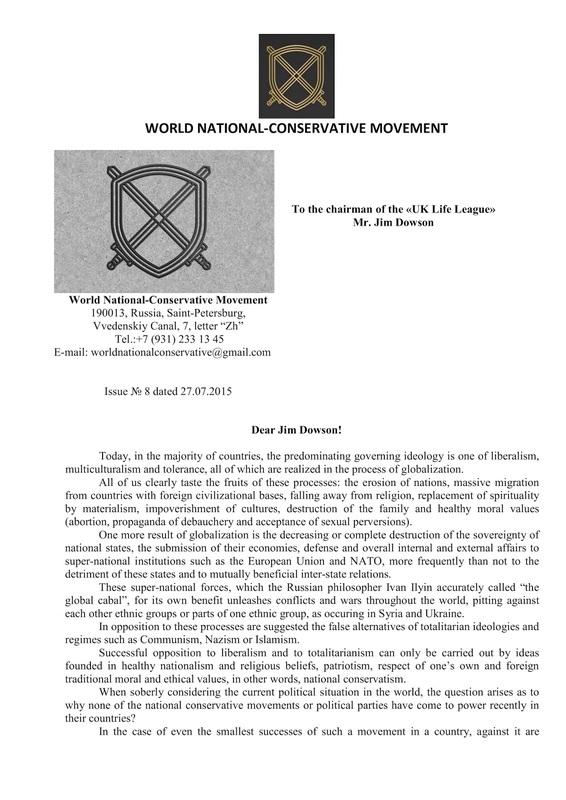 However, the core of the organisations invited to the WNCM is clearly on the extreme right, verging on neo-Nazism. The complete list of the invited groups and organisations is found at the bottom of this article. Some of the organisations invited to participate in the WNCM already took part in the “International Russian Conservative Forum” that took place in St. Petersburg in March this year, and the idea to found the WNCM was most likely conceived at that event. Back then, Rodina's initiative looked insignificant, but today the WNCM goes further than just a framework for conferences, and its programme gives evidence that the movement is focused on action. In particular, the WNCM is going to create an information network consisting of the web-sites and pages on social networks as a platform for exchanging information and experience, defend “persecuted national-conservatives and activists” by petitioning the governments, provide “humanitarian help” to Serbs in Kosovo, Christians of the Middle East, and “inhabitants of Novorossia” – a region in Eastern Ukraine occupied by Russia-backed separatists. 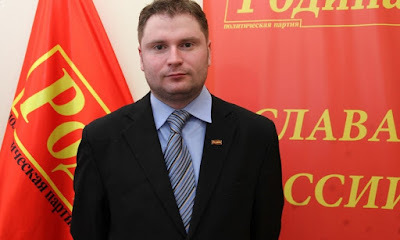 It should be noted that, in April 2014, Rodina and the Russian Imperial Movement formed the All-Russian Social Movement “For Novorossiya” that called for the annexation of not only Crimea but most of Ukraine’s territory too. A more frightening part of the programme is the intention of the WNCM to organise “joint camps for military and athletic instruction” and form volunteer international brigades that would be used in zones of military conflict. This is hardly surprising that one of the organisations invited to take part in the WNCM is “Unité Continentale” that was formed in summer 2014 by French and Serbian ultranationalists who volunteered to go to Eastern Ukraine to support Russia-backed separatists. Moreover, in July-August 2015, the Russian Imperial Movement advertised a week-long military camp called “Partisan” and invited men to learn survival techniques, urban guerrilla tactics, military topography, as well as practicing with Kalashnikovs and other weapons. It may be too early to sound alarm, but the formation of a Russia-backed far right international movement that will have a military component may become a serious challenge to democratic societies in Europe. If you liked this post, you may wish to consider donating to the development of this blog via PayPal. the mainstream right – political parties such as Perussuomalaiset (Finland), Jobbik (Hungary), Slovenská národná strana (Slovakia), Kongres Nowej Prawicy (Poland), and some others. However, the core of the organisations invited to the WNCM is clearly on the extreme right, verging on neo-Nazism. No, these are not mainstream right. Well Perussuomalaiset (PS) may not be "mainstream right" rather "populist right", but not extreme right and definitely not in th Jobbik camp. And by the way, PS is part of the current finnish government coalition. Perussuomalaiset (PS) is not extreme right as a whole, but there is an extreme right faction in the party that has joined the party after it's establsihment. Thee extremist hold some very different views when compared to the mainstream party members. Янукович по-прежнему хочет Тягнибока во втором туре? Is Russia Insider sponsored by a Russian oligarch with the ties to the European far right? A comment on Cas Mudde's article "A new (order) Ukraine?" Paul Jackson reviews my book "Russia and the Western Far Right"